You’re a self-proclaimed witch or wizard, and you already know which house you’d be sorted into. Unfortunately you never got your Hogwarts letter, but that shouldn’t stop you from embracing your love of magic by having a Harry Potter wedding. Celebrate your big day with these 25 Harry Potter wedding ideas that are guaranteed to enchant even the worst muggles. 2. Next, send out your save the dates, aka your guests’ tickets to the Hogwarts Express. Unfortunately these can’t be delivered via Owl Post. 3. Then, send out your Harry Potter wedding invitations. The Daily Prophet probably has a section for wedding announcements, right? 4. In a perfect world, you’ll have exactly four bridesmaids so each of their dresses can represent the house colors. Your attire will likely be a Harry Potter wedding dress too. 5. Guests will wonder where to sit. The Sorting Hat will be there to direct them! 6. You’ll need a Hogwarts guest book. 7. And an authentic quill so guests can sign it. 8. Pay homage to Quidditch with a Golden Snitch-inspired or Harry Potter wedding cake. Bonus points if you cut it with the sword of Godric Gryffindor. 9. Naturally, the iconic drink from The Three Broomsticks should be available at the bar. There’s a great Butterbeer recipe here. You can also serve up potions at the cocktail hour, like Amortentia, Polyjuice potion, Felix Felicis, Calming Draught, and the Wolfsbane potion. 10. These wands will make awesome Harry Potter wedding favors. You can even DIY them with chopsticks, hot glue, and paint! 11. Howlers will make cute programs, or even thank you cards! 12. 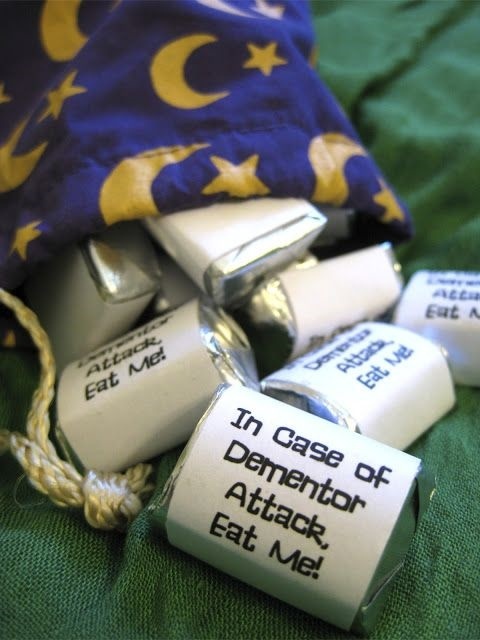 Everyone knows chocolate is the best remedy after a Dementor attack. 13. For more practical party favors, these key bottle openers will come to life when you DIY them with wings! (Note: Only the levitation charm will make them fly around. Remember, it’s leviOsa, not leviosAR). 14. Your Honeydukes Candy Bar will need all the best! 15. If there’s kids at your wedding, keep them entertained by playing Death Eaters – complete with these Dark Mark temporary tattoos. 16. Keep the adults entertained too by hiring a fortune teller! But only if she’ll agree to dress up as Professor Trelawney. 17. Speaking of entertainment, keep the party going after the reception by playing Quidditch Pong! 18. This decanter will make an amazing wedding gift for the couple, or even groomsmen or bridesmaids gifts! 19. Your Harry Potter wedding centerpieces can revolve around the different classes offered at Hogwarts. 20. Guests can drop their marriage advice + well wishes into this Goblet of Fire. 21. You probably won’t want to hand deliver your invitations, but these Hedwig balloons make cute centerpiece ideas! 22. You can see if your venue will work with you to “enchant” candles to float on the ceiling. 23. Instead of flowers, you can purchase (or make) a Harry Potter wedding bouquet made from the pages of your favorite book in the series. 25. And finally, hire a bada$$ photographer to capture all of the magical moments of your Harry Potter themed wedding.